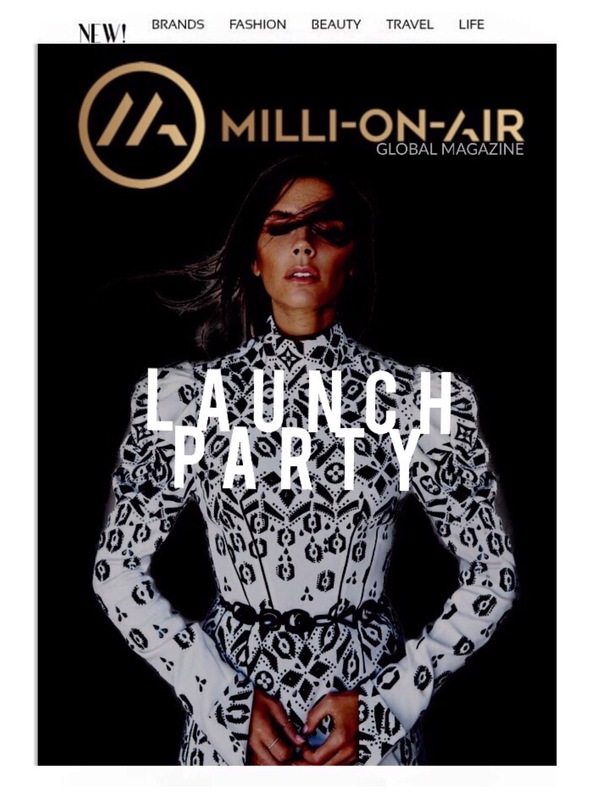 MilliOnAir Global Magazine had it’s very first Launch event in London at Alfie Best‘s stunning new venue in the Vinyl Bar in St Paul’s on Tuesday 31st January. The launch brought the MilliOnAir Team together…Millie Cooper Editor in Chief, Lori Mixson USA partner and Mariett Ramm International Business Coordinator, with Jamie Baulch and Claire Smith as guest speakers, as well as inspirational individuals and luxury brands from around the globe who have appeared in past and current issues of the magazine. Millie with Lori Mixson our USA Business Partner – who writes the ‘Mixsonitup pages’ in MilliOnAir Magazine. This Launch party celebrated the release of the February issue 09, sporting a new logo created by branding expert Sonny Brahma, with cover star Tony Schiena – featured in Lori’s Mixsonitup pages. We started the evening with a champagne reception and canapés, then came the hundreds of photograph’s in front of our sponsor board. The wonderful inspirational Olympic athlete and former MilliOnAir cover star Jamie Baulch gave us a fabulous speech about Millie and her journey over the past 8 issues. (Look out for new ventures with Jamie coming up in our March issue). Jamie Baulch with Mark Llewhellin who came along with the Channel 4 TV stars from SAS Who Dares Wins (See Mark here interviewing Mark Billingham). Harry Reid from Eastenders was also amongst the guests. Also in attendance was the stunning Claire Smith TV Personality who interviewed Millie to find some secrets of who she will be interviewing in the future and also to find out where Millie saw MilliOnAir going in the future! All very very very exciting! Also in attendance was our beautiful friend Jenny Lee Holt, Co-founder of sponsor Spectrum Telecoms. Our August cover star Celia Sawyer also popped along and joined in the celebrations. After the speeches Liss Jones star of The Voice, X Factor, Big Breakfast and Stars in their Eyes sang some absolutely wonderful songs. A HUGE THANK YOU to Vinyl Bar’s owner Alfie Best who was there with World Champion cage fighter Tony Giles. The next planned #MOALaunch is the LA Launch in October. Millie, Lori and Mariett want to thank the sponsors of the MilliOnAir Launch event – Who are all truly amazing! Photo Credit to Gibson Blanc for the launch event photos included here. Contact Him.